Petaluma Seed Bank, the Western branch of Baker Creek Heirloom Seeds, hosted a Nourish screening and conversation about local food issues. The Seed Bank promoted the event widely to community groups, resulting in a diverse audience of more than 200 people, including educators, health workers, farmers (conventional and organic), master gardeners, community college students, professors, local business owners, activists, and other concerned citizens. 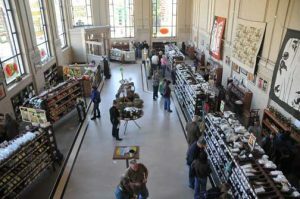 Situated in the heart of Petaluma’s bustling downtown retail district, the Seed Bank is housed in the historic Sonoma County National Bank building, a grand, high-ceilinged structure built in 1912. The Seed Bank offers more than 1,400 varieties of heirloom seeds, plus tools, books, and locally made gifts and food items. A regular host of community events, the Seed Bank serves as a gathering place for people to share information about good food and sustainable living. The evening began with an informal reception, allowing participants to mingle and browse the store’s offerings. Following a sit-down screening of Nourish, there was a panel discussion, including Grayson James, executive director of Petaluma Bounty; Trathen Heckman, founding director of Daily Acts; and Vanessa Passarelli, a founding member of the Sonoma County’s School Garden Network. Audience members representing a broad range of interests participated in the discussion and shared information about how to get involved in improving Petaluma’s local food system. As part of its educational outreach, the Seed Bank currently holds gardening classes and uses Nourish as an introduction to food and sustainability issues.